Soccer was always a big part of Club Loreley. Founded November 1955, the "Oshawa Kickers" under the leadership of Josef Schmied, Toni Meier, Karl Esser and Roger Wolfe attained their first league cup in 1956; success followed success. New players signed on, and the Kickers reign was not to be broken. The most successful year was in 1959. The team won all the elimination games, and made it into the finals for the Ontario Cup. The opposition was a team from Hamilton. After an excellent game, the Kickers were defeated by a score of 1-0 before a sellout audience here in Oshawa. 1962 was the last season that the team played under the name the "Oshawa Kickers", many went back to Germany, or found jobs elsewhere; a successful era came to an end. In 1965, a new team under the name "Loreley Kickers" was registered with the league. Unfortunately the team was dissolved in 1971, and since then there has not been a first place team. A new era started with the founding of the "Old-timer", The team was founded in 1968 by Henry Seiffert. The coaches and Managers at that time were Henry Seiffert, Ebby Harm and Ernst Stader. 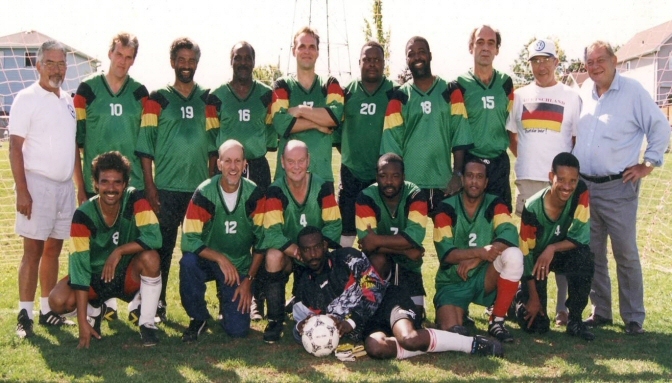 The Old-timers (Alte Herren) took part in every event held by the Old-timer Soccer League. Tournaments were played at Club Loreley Picnics. Teams from as far as Kitchener and St. Catherine's participated in these tournaments. With pride we can say that we won the first donated Trophy three out of five times, and it's still in our possession! Unfortunately, there is something which cannot be stopped, and that is aging. Presently, the soccer program has been discontinued due to lack of participation/interest.